For reasons known only to the Facebook illuminaries, my blog entries aren't posting to FB...so lots of people are missing out on this contest. I'm posting this as 2.5 rather than 3 to see if I've got it straightened out. Make a comment and enter to win a free painting which I will draw and announce after I've posted number six. This one counts for comments but not in the six. This was painted for the abstract qualities of the shapes. I'm teaching another plein air workshop this weekend and it promises to be a perfect two days for working outdoors. There is room for another if you want to join us even for a day. We are meeting at 9 am at the Winslow Art Center and heading out from there. To those of you that have posted, keep them coming. It's fun to hear your comments and you get another entry for that free painting. Number Two in the 'make a comment and enter for a free painting' thing begun in the last post. All you have to do is make a comment via my blog or my email to be entered. The more comments you make the better your chances. This painting has been shown several times, sold once but the buyer changed to a different one, and then recently resurrected with a few color shifts and additions. You can see the original version on my website HERE. 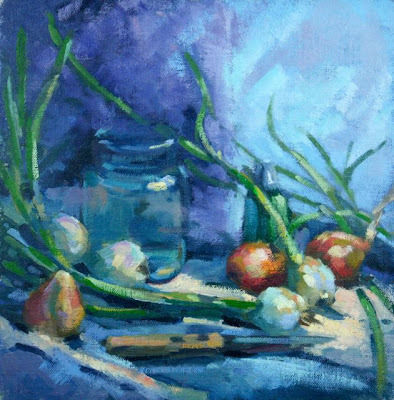 I remember when I originally painted it that it was an exercise in using a very limited palette. The color wheel choices I used are on the back of the painting. When I adjusted it recently I had just purchased a couple new colors I wanted to try out and thought they gave the painting some subtle nuances it needed. I was pleased and wanted to share it. 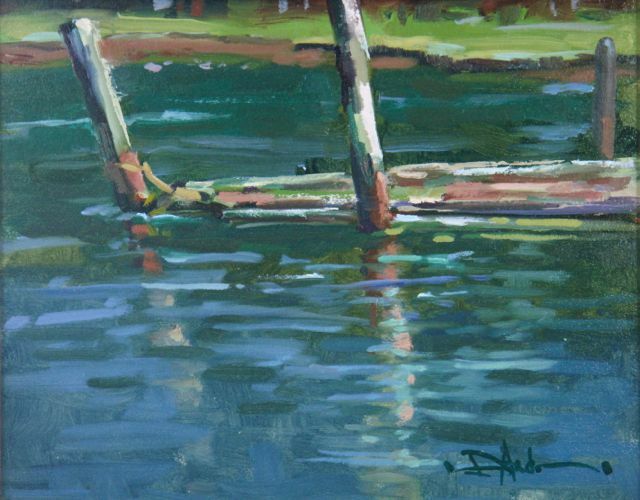 Summer Plein Air Workshop is coming up. 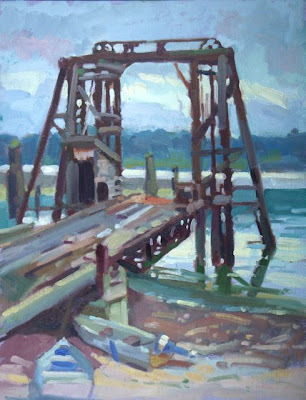 Two days of painting outdoors with all kinds of good instruction about color mixing, simplification of shapes, design possibilities, outdoor equipment choices, demonstrations and much more. 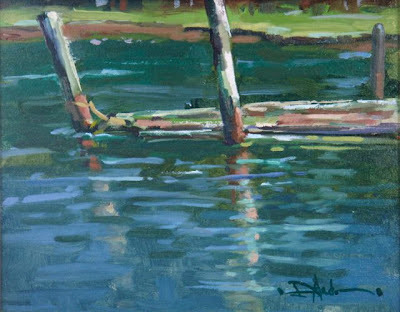 If you want to learn about color dynamics, plein air is the way to do it. July 28th and 29th. Contact the Winslow Art Center for details. Actually there is no longer a Port Gamble Ferry and I don't even know if there ever was one, but I would assume so....and from the looks of it this would have been the adjustable ramp....for 1940's vehicles. I sat in the car during off and on pouring rain to do this one. Whacked out three that day and only scraped one. Ah well. I like the back lit effect of the structure and the many greyed colors it took to represent it. For those of you who actually read this blog you will be rewarded by finding out that I'm going to have another painting give-away. There will be six posts, beginning with this one, and for every comment you make you will gain another chance to win. One of the paintings I'll be posting will be the prize but I won't let you know until the end which one it is. Should you have difficulty posting (some do) you can just send a comment to me via email. The address is HERE.